I had some left-over chilli paneer and decided to recycle it in tortilla wraps I had lying in my larder and served with a yoghurt chutney. The result was delicious. This is a simple and easy recipe and the ingredients are locally available here. It doesn’t need much cooking but the flavours do depend on the amount of time you marinade it. Cube the Paneer and then add all the ingredients in a non stick pan and mix well. Allow to marinade for at least an hour (or more if time permits) then just cook gently on a medium heat for about 10 minutes. On each tortilla wrap, put some of the chilli paneer and roll around. 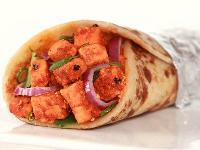 For easy handling secure one half of the wrap in foil once you have rolled it with the paneer inside. It tastes delicious dipped in a garlic yoghurt chutney. I definitely have to try this!! !